This weekend at South Street Seaport enjoy performances from b-boy group Rock Steady Crew, hip-hop from End of the Weak and sets by PBnDJS. Meet at the southwest corner of Delancey and Essex Sts, in front of Chase Bank. Head downtown to explore the diversity of Lower East Side cuisine with your dad this Father’s Day, for a tour that focuses on restaurants of the Jewish East Side, Little Italy and Chinatown. Writers Leigh Newman, Rob Spillman and Dani Shapiro read stories about their old men at this special panel hosted by Brian Gresko, a stay-at-home Brooklyn dad who writes a daily column about fatherhood for Babble. Who doesn’t enjoy a great pie of pizza on any given day, let alone Father’s day? Head over to Brooklyn Heights for some delicious, hand made pies at Juliana’s. Then take a walk along Brooklyn Bridge Park to work off all of those carbs you regrettably consumed. 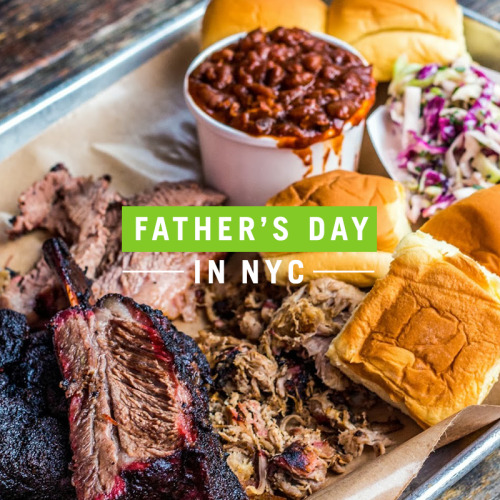 If your dad prefers a heartier meal, give him a shot at stuffing his face with some amazing BBQ at Fette Sau in Williamsburg.